Many of our passengers believe that we humble cabin crew are spawns of the devil himself, especially if we offload them for being too drunk, ask them to stow their luggage, turn off their electronic equipment, or heaven forbid we run out of the chicken meal and can only offer them beef. I’m a sinner I like it that way…….. 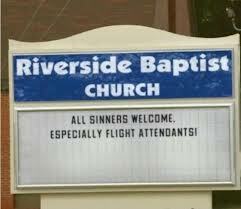 So I was surprised when I discovered that the Church had created a Patron Saint of Flight Attendants, back in 1962. Born in 1156 in Pisa, Italy Santa Bona was said to have been able to see visions of Christ and the Virgin Mary from an early age. During one such vision, she is reported to have been chased by James the Greater after seeing him, Jesus and The Virgin Mary. James then led her back to the image of Jesus, who held out his hand to her. 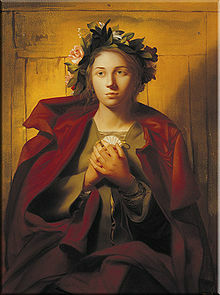 After this she dedicated the rest of her life to Saint James and became an Augustinian tertiary. Well I guess being chased by a dead saint and having Jesus himself trying to hold your hand would freak out even the most religious of people. She subsequently took part in regular fasting, eating only bread and water three days a week; somewhat similar to the fad-diets many of us girls and boys try onboard today, in an attempt to squeeze into our party frocks down-route. Still, I guess it’s better than eating crew food. Santa Bona Patron Saint Of Flight Attendants. A cheerful and adventurous child, Bona always wanted to explore what lay outside her small home town. At just 14 years old she made the first of many long and treacherous journeys, that would subsequently lead to her sainthood. Bona had gone to visit her father, who was fighting in the crusades near Jerusalem. But on her way back to Pisa, she was captured by Islamic pirates in the Mediterranean. Wounded and imprisoned, she would later be rescued by some of her countrymen and eventually returned home. But nothing daunted Bona and she didn’t stay in Pisa for long. She soon set out on another pilgrimage, leading many on the dangerous thousand mile journey to Santiago De Compostela, where James the Greater is honoured. Following this trip, she was made one of the official guides for this pilgrimage by the Knights Of Saint James; ensuring those that travelled the route, had stowed their hand luggage, fastened their seat-belts, knew where the emergency exits were and most importantly arrived in one piece. Santa Bona completed the trip ten times. However, on the tenth trip she became ill and passed away on her return, aged just 51. 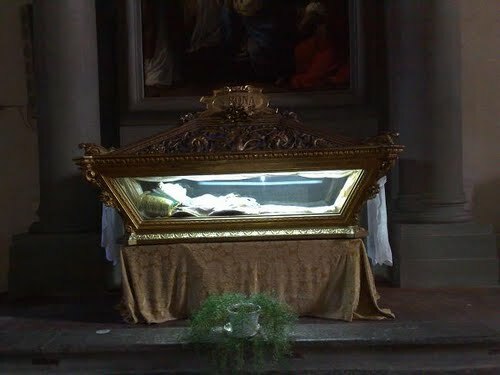 Her body was found in the room she kept near the church of San Martino in Pisa, where it still lies to this day. In 1962 the Roman Catholic Pope, John XXIII canonised her as Bona Of Pisa, Patron Saint of Flight Attendants and her feast day is celebrated on 29th May each year. This amazing woman took care of thousands of travellers on their pilgrimages, long before man had even taken to the skies. Today things are very different and cabin crew have to put up with a lot more than a few rowdy pilgrims. The constant threat of terrorism, abusive, drunken and violent passengers, long working hours and airlines that are constantly battling to stay in business. So today, as you take to the skies just remember that we are all saints. We have to be to keep smiling through all the crap!